I learned this recipe on a recent visit to Vietnam. 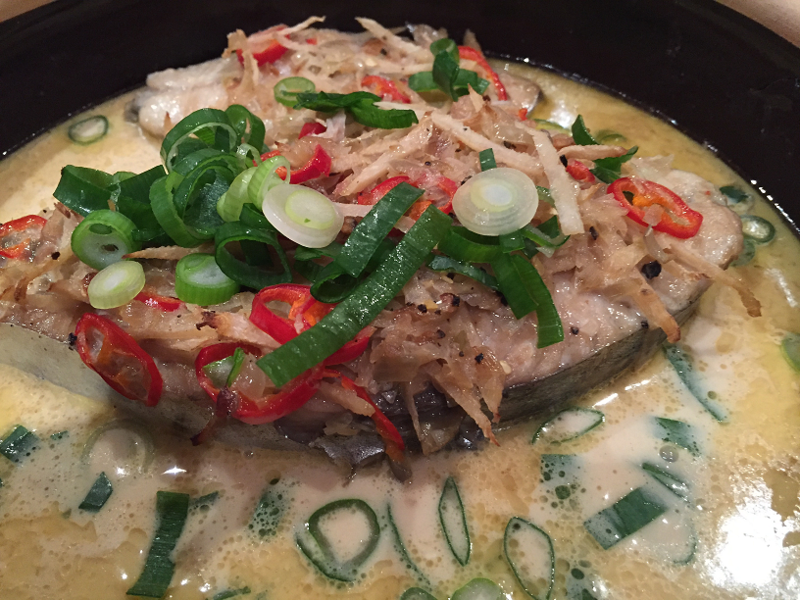 It surprised me how well the usually quite strong mackerel married with the richness of the caramel & coconut milk. Combine the mackerel with the Asian shallots, black pepper and 2.5 tbsp of the fish sauce. Marinate for 20 minutes. In a saucepan over medium heat, add the sugar and 1.5 tbsp of water. Stir until the sugar dissolves. Bring to a boil. Cook until the sugar is a rich golden colour, about 5 minutes. Standing away from the pan to avoid splatter, pour in 2 cups of water. When the splattering has stopped, stir until the caramel sauce is smooth, about 5 minutes. Preheat the oven to 180 C. In a sauté pan, over medium-high flame, heat a little oil. Brown the fish on both sides. Add the remaining fish sauce, caramel sauce, coconut milk, galangal and chilli. Bring to a boil. Immediately remove from the heat. Transfer the fish and sauce to a clay pot or casserole dish, cover and bake for 10 minutes. Remove the lid and bake for a further 4 minutes. Serve the fish in the clay pot, sprinkle with the extra pepper, green shallots and coriander.